Biomarkers of Myocardial Infarction: 18 antibodies and antigens for diagnosis and prognosis. - Advanced ImmunoChemical Inc.Advanced ImmunoChemical Inc.
Home » Article » Biomarkers of Myocardial Infarction: 18 antibodies and antigens for diagnosis and prognosis. Cardiovascular diseases are a group of disorders that occur in the heart and blood vessels and are the world’s leading cause of death. Researchers are currently studying whether tests that detect levels of cardiac troponin I (cTnI) in the blood my help physicians diagnose heart attacks sooner. For over 20 years, Advanced ImmuunoChemical, Inc. has been at the forefront of providing reagents for cardiovascular diseases diagnostics. We offer a broad panel of well-characterized antibodies and antigens, as well as analyte depleted serum or plasma products that are suitable for immunoassay development on various platforms. 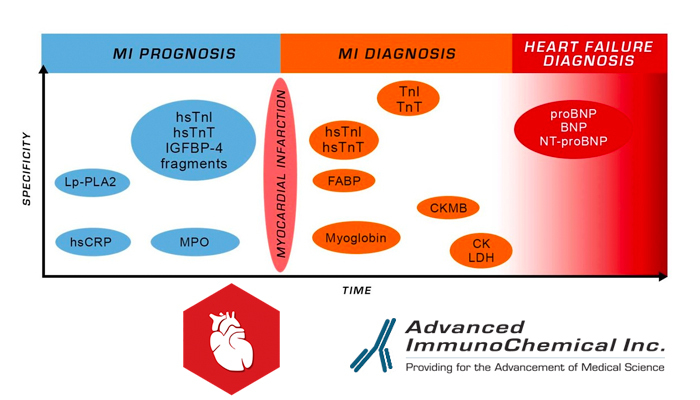 Highly sensitive cTnI is the gold standard biomarker for diagnosing myocardial infarction. Among numerous monoclonal antibodies developed against troponin I, we offer a select 35 for our catalog. We also provide other troponin I related products which include a wide selection of different purified troponin preparations – both native and recombinant. In 2004, our cardiac troponin complex material was chosen as a raw material for the International Troponin Standard. Figure 1. Eighteen Cardiac Markers for diagnosis and prognosis of AMI from Advanced ImmunoChemical, Inc. Note unique specificity and time coordinates for each. References: Cardiac Marker Product Articles, authored by our manufacturer’s scientists.